I'm once again plotting a multi-day ride through Virginia and West Virginia. I've done this the past two years and ended up cancelling, so we'll see if this work. The plan is that on June 29, I pop on I-81 south and spend the night in Front Royal, VA. The next day I ride Skyline Drive and the Virginia section of the Blue Ridge Parkway, spending the night in Galax. On July 1, I pick up Route 16 in southwest Virginia (which I've heard is stunning) and stay on it through West Virginia, over nighting in Weston. The next day I slip back through Maryland and into Pennsylvania, taking Route 30 back to the east. The weather has been stunning but the combination of meeting the needs of my devil dog and frantically working on a consulting project due next month has kept me close to home. 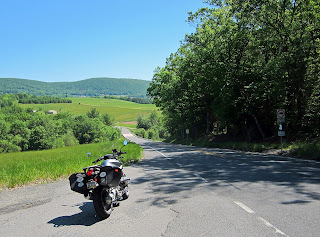 I did have a nice 200 mile ride east of the Susquehanna yesterday weaving together some of my favorite stretches of road--Route 443, the lovely Goldmine Road (where I someday want my ashes scattered), and routes 125, 225 and 849. The first part of the ride was great but during the last hour I ran into a number of fun thieves lumbering slowly along twisty roads with no passing areas. That's always a risk on weekends. I picked this ride because my GPS is once again in the shop so I needed a route that I knew well. This will be the fourth replacement or repair of my Zumo 220. Garmin has some serious quality control problems. Since I normally use the digital speed display on the Zumo, I found myself pretty much disregarding my speed. Luckily I only hit one speed trap and was behind a truck and a line of traffic at the time. So my ticketless string--I was last cited in 1998--continues. During a quick afternoon ride on Friday I was in a trance, flying along Route 997. This is an amazing little road that twists for 15 miles through Amish farm country. It's not unusual to ride the whole stretch without seeing a car on the road. But then I came roaring around a curve as a pickup pulled out in front of me. Luckily once the driver realized that he'd screwed up, he stayed on the gas rather than hitting the brakes so I was able to scrub off 20 miles per hour of speed and swerve around his rear. It was a buzzkill, knocking me out of my trance but could have been disastrous a few years ago when my riding skills were less developed. I've been thinking about something during recent rides. I almost always listen to music on all the shortest rides, usually electronic dance music like techno, house, and trance. This is a bit strange since that isn't something I'd normally listen to. But here's my theory: being physically awkward, I never danced. On the bike, though, I can be graceful and elegant. When I'm really in a groove it's like I'm floating above reality. So riding is my dance and I'm drawn to dance music. Since I have lots of time to think while riding (which it part of its appeal), one other thing recently popped into my mind. When asked why they ride, many people say, "the freedom." When I first started, that made no sense to me. After all, a car can go pretty much anywhere a motorcycle can. But over the years I've come to understand it even though it's hard to explain. In part it's because on a motorcycle you don't have all the passive protection you have in a car--air bags, steel beams, and so forth. You live (or in some cases don't) based purely on your own skill. That is psychologically liberating. On a quick, agile bike like mine, there is also a physical freedom since with a slight movement of my hand I can flick the bike wherever I want it to be. And there's also the fact that you're part of the environment rather that being separated from it. Birds fly right by your head, you feel cold, heat, rain, and smells more intimately than in a car. So it's like you've been freed from the thousand pounds of metal that encase you while driving and, at times, from the laws of physics. It almost seems as if there is no machine involved. All of this is a form of freedom but it's a type that's very hard to explain unless you experience it. I do have one ride thing coming up--in June my boss and I are planning to ride to a conference our organization is involved with in Kingston, Ontario. The plan is to take a leisurely two day ride up hitting the state parts of north Pennsylvania and New York's Finger Lakes district. We'll spend the night in Geneva, NY then cross the St. Lawrence River by ferry. The last day of the conference, I've plotted a 95 mile ride north of Kingston around Fronteac Provincial Park. We'll do the return in one day, re-crossing the St. Lawrence on the Thousand Islands Bridge, taking I-81 to Cortland, NY, then cutting over and picking up Route 15 which will bring us home. We just have to hope for non-horrid weather since that might kill the ride. The pattern of my life has always been to take on new challenges and seek new skills, pursue them to at least the point of minimal competence, then lose interest. Motorcycling is different. After nearly four years and 70,000 miles, I remain as passionate as the beginning. If I could, I would do nothing but ride. That said, I rode less in the past winter and passing spring than in the past. There's a reason. In early January, I lost my nine year old Golden Retriever to cancer. This devastated me more than the loss of any of my other dogs, so three days later I bought a five month old Doberman puppy. This has been--to put it lightly--an intense experience. Because I enjoy and feel obligated to spend as much time with him as possible during this crucial part of his life, I've only snuck out an occasional medium length ride on the weekends (and, for me, medium is 150-250 miles). This means that I'm traveling routes that I've ridden many times. Hence little blogging or photography. 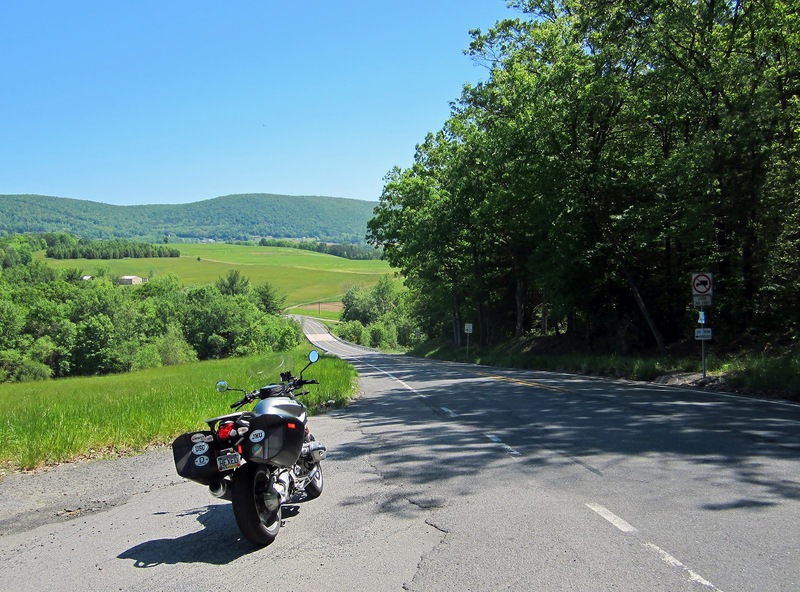 In June I plan to ride to a conference in Kingston, Ontario, hitting the great roads of north-central Pennsylvania, passing through New York's Finger Lakes region, and crossing the St. Lawrence River by ferry. Hopefully there will be some photo-worth experiences then. I'm also toying with trying to reconstitute the full-length-of-the-Blue-Ridge-Parkway that I had to cancel last year, but an invitation to spend a week in Singapore in August will cut into my available vacation time. Since I took no vacation in 2011, I do have a stockpile, so may pull it off. At a minimum, I plan on some two or three day rides through Virginia and West Virginia. So stay tuned. There is one other thing of note. In March I retook what the Motorcycle Safety Foundation used to call the Experienced Riders' Course and now calls the Basic Riders' Course 2. This is a day of coached instruction, including nine skill exercises in a large parking lot. This is the fourth time I've taken it during my days of riding. In every course, there are riders with marginal skills who struggle to pass the final test (and sometimes fail) and other, more experienced ones who do it with ease. Happily I've moved from the first category to the second. I didn't get a perfect score like the last time I took it, but I suspect I was close. Even the daunting exercise euphamistically known as "the box" which requires two super tight U turns in a box about the size of a three car garage, which used to flummox me, is easy now. I'll admit, though, that my ease with the course had less to do with innate skill and more to do with my motorcycle--it's signficantly easier to do a fast stop or swerve on a BMW with anti-lock brakes than on the huge, hulking Harleys than most of the other riders in the course used--and the fact that I ride year 'round so didn't have any winter rust to knock off. Still, after all of my struggle learning to ride, I have to admit that it was wicken fun to snicker at the difficulty some of the other riders in the course were having. Bad me!